The tank operator gazes about a digitally augmented view of world outside his heavily armored vehicle through a pair of virtual reality goggles. No, this isn't the teaser for a new sci-fi flick — it's being tested by the Norwegian army right now, using off-the-shelf tech (not counting the tank, of course). Tanks' most serious tactical weakness is perhaps visibility. Under fire, with the hatches closed, only slivers of the environment can be seen through ports and deeply embedded cameras. It leaves them open to attacks in blind spots and makes maneuvering difficult. Norway's latest experiment is meant to alleviate this vulnerability. Ultra-wide-angle cameras are mounted on the tank's exterior and the feeds combined into a single, nearly spherical image, which is viewed by the operator using an Oculus Rift VR headset. The result is a massive increase in visibility: Without poking his head out of the hatch, an operator has a nearly unobstructed view in all directions. You can see the system in action in this video by Norwegian news site TU. "Those who play 'Battlefield' can see much better than you do in an actual vehicle. With our software you can add elements we are used to from games. You can have a map, you can show orientation, how much you tilt, the speed." That may sound trivializing, but young, game-savvy soldiers may thrive in a high-tech virtual environment like this. And these features could very well save lives. As if that weren't enough, it's cheap. 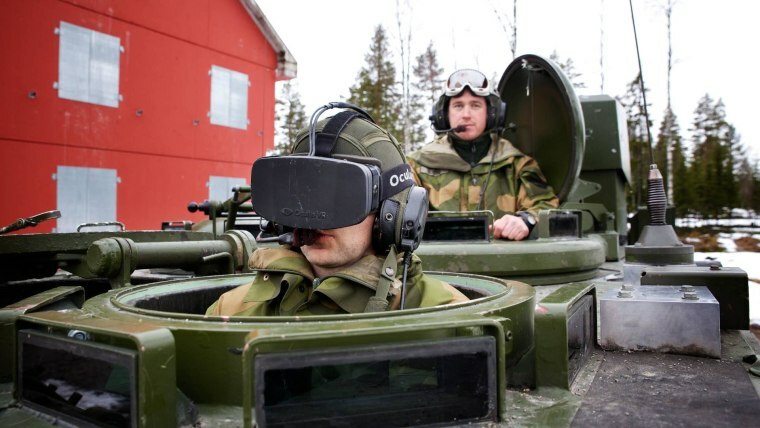 Ola Petter Odden, of the Norwegian Army's Combat Lab, said the cameras cost around $2,000, plus $350 or so for the Oculus unit. For the military equivalent? $100,000 for the cameras, $35,000 for the headset, he estimated. It's not ready to deploy: The headset causes eye strain with long use, and of course the consumer cameras will need to be hardened a bit for combat. But Odden is optimistic: He says this cyber-tank could be ready for action in less than five years.